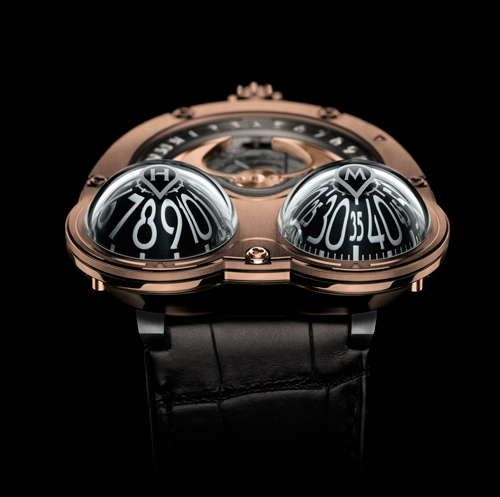 HM3 Fire Frog is a limited edition of 10 pieces created exclusively to celebrate the opening of the MB&F Beijing boutique. 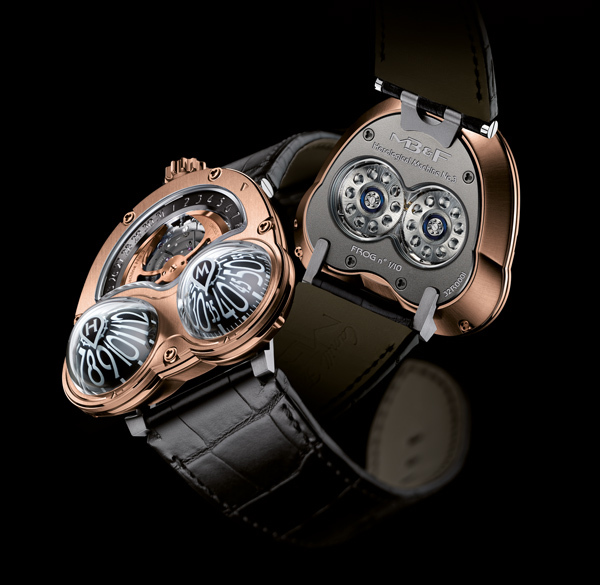 Fire Frog is named for the warm glow emitted by the 18k red gold of its complex case and 22k red gold winding rotor. The animated rotor on top of the Jean-Marc Wiederrecht-designed complication is framed by an oversized date wheel, while rising up from the fire are the iconic bulbous domes of the Frog’s hour and minute indicators. The protruding eyes of real-life, amphibious frogs enable them to see in many directions without having to turn their head. 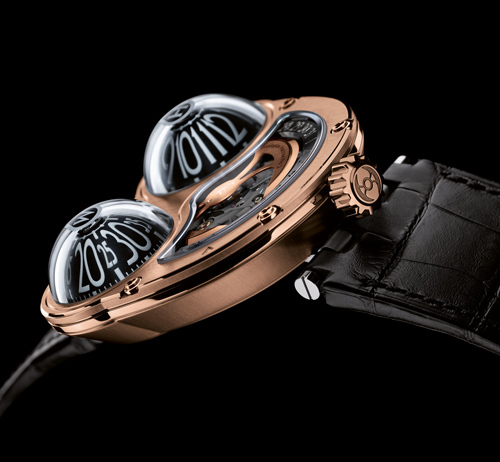 The bulbous hour and minute domes of HM3 Fire Frog create a similar effect, though in this case it means the wearer can easily read the time from a variety of angles without having to turn his or her wrist. The hour and minute domes are meticulously honed from solid blocks of aluminium, chosen for its optimal strength to weight ratio – the domes weigh just over 0.5g. First, they are milled from the outside and then the inside to arrive at a paper-thin and energy-efficient wall thickness of just 0.28mm. Fire Frog may portray the time and date playfully, but there is nothing but serious attention to detail regarding the fine hand-finishing of the highly-tuned engine that purrs away inside. Battle-axe shaped ‘mystery’ automatic winding rotor. Domes and both displays front and back have an anti-reflective treatment on each face.